When it comes to buying a scale for virtually any use, there is really no substitute for accuracy. This is especially true in industrial and agricultural environments, where the accuracy of a scale’s weight reading is almost directly proportional to costs. An inaccurate scale can be a costly liability, especially since it’s used on a daily basis to calculate things like prices and the cost for the transit of goods. Luckily, the technology behind some of the world’s most advanced and accurate scales has increased rapidly in recent decades, combining the best of manual measurement tools with digital readouts that act like a double layer of verification and accuracy. Those in the industrial or agricultural industries would be well advised to consider one of these ultra-precise scales as they seek to save money, time, and peace of mind on the job. Most consumers aren’t aware of this, but the average scale used for weighing packages, shipments, and even livestock, is designed to be within a half-pound of the actual weight of what is being measured. Furthermore, these scales are actually programmed to round up, adding as much as a full half-pound to every measurement and costing businesses a great deal of money as they seek to cut costs and stay in a tighter budget amid an uncertain economy. This is simply not acceptable in most cases. Even though these scales are designed with the best of intentions, typically to ensure that a shipment is not under-weighed and thus returned to the originator of that shipment, they can certainly be improved upon. The next level in scale accuracy actually doubles how precise the scale is when calculating weight, coming within a quarter-pound of the exact weight of the package or animal. That’s better, but it’s still not good enough for many professionals. This is where the use of an ultra precision scale comes into play. These scales are designed to be accurate within a tenth of a pound, or one percent of the item’s total weight. That’s a vast improvement on both a half-pound and quarter-pound accuracy scale, and it’s the way that many businesses are saving a good deal of money on their livestock transactions and industrial shipments. 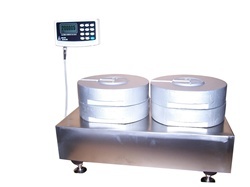 We produce two key kinds of ultra precision scales for its customers. The first is the Arlyn 6200 Series Bench Scales, which can determine the weight of a shipment or another item within a tenth of a pound, or one percent of the item’s total weight. Furthermore, this scale employs surface acoustic wave technology for even more accurate readings of an item’s weight. This highly precise scale can even compensate for changes in temperature that might affect how the shipment is measured by the scale on which it sits, which is something that can hardly be found with any other scale currently on the market. If this scale is simply not precise enough, then buyers have another option that might be of use to them. Instead of the Arlyn 6200 Series Bench Scales, they can choose our SAW Series of bench scales, which is actually exponentially more accurate than the 6200 Series. These scales actually read the weight of an item within one one-hundredth of the actual weight of the item, and they’re within 0.1 percent of the package’s actual weight, every time. These scales are named “SAW” because of their patented (and trade secret) use of surface acoustic wave technology when calculating the weight of an item. This puts these scales in a class by themselves–they’re unlike anything else currently on the market. We are unlike other scale manufacturers currently marketing their products to industrial and agricultural customers. Other companies typically sell scales that they term “ultra precision” and they pair those scales with an aluminum load cell. This might sound perfectly durable at first, but that’s actually not the case. Indeed, these scales are often placed in areas where heavy loads may be placed on the scale in a less-than-delicate fashion. This results in the aluminum buckling or breaking, producing fractures, and these high shock loads can lead to plastic deformation that will further decrease the accuracy of the scale. By comparison, the ultra precision scales sold by We do not employ substandard materials when working to ensure the long-term accuracy of any product. Instead of using aluminum to create the load cell, we employ only stainless steel. As has been widely known in the industrial industry, and elsewhere, stainless steel is far more durable under high-pressure loads, and it resists load shock far more effectively than aluminum. That results in long-term accuracy that is unchanged, unmodified, and reliable every single day. And it creates an environment where workers don’t have to worry about how hard or heavily they place an item onto the scale, promoting greater efficiency and productivity. All scales, even those marketed as ultra precision, have a weight limit. When that limit is exceeded, the scale will stop performing and it will be unable to read the weight of the package. This excessive weight can also cause the platform to “hit” the floor, or whatever base it has been situated on, and this can cause damage to the internal components of the scale that actually ensure the accuracy of the device on a regular and consistent basis. Aryln scales, much unlike several competing options, actually include a generous amount of space between the platform of the scale and the surface on which the scale is situated. This gap is reinforced, and it’s a great way to save the integrity of the scale under extremely high loads. It won’t always help when a very heavy “instant shock” is placed on the scale, like dropping a package that also happens to be too heavy for the equipment. But the raised platform and the protection of the gap between the platform and the scale’s environment do provide extra insurance in every other scenario. It’s really important not to cut corners when creating a scale that is marketed as an ultra precision device. The people behind the products at wee know this, and that’s why we have been committed to creating products made from the best materials, and using the best forms of protection and insurance for the actual weighing mechanisms. That’s why the company is one of the only ones to include a stainless steel load cell over the typical aluminum version offered by its competitors. It’s also why we have a sizable gap between the scale’s platform and the surface where the scale sits. In every facet of ultra precision scale development, we have used its commitment to technology and quality to create highly accurate products that last through even the harshest environments. Surface acoustic wave technology, combined with great industrial materials and a sleek industrial design make the Arlyn 6200 Series and SAW series bench scales among the best anywhere. Industrial and agricultural customers can count on these scales for a precise, cost-saving reading that will pay dividends over the long-term. Call 1-800-645-4301 or check our online catalog online catalogue today to find the most accurate scales on the market today.